Best Brothers Group are an established automatic door systems provider based in Vancouver. Our starting point is to carry out a full site survey prior to installation so that we can offer you the best advice, as we sometimes find that when a client knows what they want they may not have thought about all aspects of the project. BBG takes care of this for you. We have plenty of images online that can help you to find your perfect system. Head over to our gallery page and see some of the projects we have completed in Vancouver, Richmond and Burnaby or give us a call and we can walk you through different options of what is available to you. BBG cover power-operated pedestrian door equipment such as swing, revolving doors, sliding and folding doors. 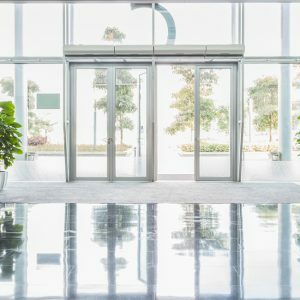 Key factors include the requirement for building owners to ensure doors covered by the standard are correctly maintained for safety, long-term reliability and efficiency. It also stipulates requirements for maintenance record keeping, and improved safeguards to prevent crushing and impact injuries.